Who is Making Your T-Shirt Quilt? Not All T-Shirt Quilt Makers Are Equal! What? All you need is a sewing machine and scissors! Right? Ahh No.. 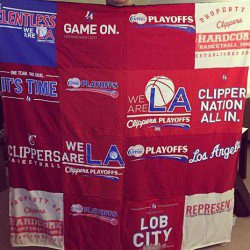 There are several factors that go into creating that special t-shirt quilt. Let's look at WHO is making your quilt. While well-intentioned, the Mom/Daughter team might work out once or twice to create a quilt, but they are not set up to do more than a couple of quilts a month. Usually, friends of one or the other ask the Mom/Daughter team to make a quilt, and the team gets to work, clears off the kitchen table and about six months later a quilt is born! This is where a friend asks someone who 'sews' if they will make a quilt for them. Well intentioned crafters take on the project. Heaven knows that they have never done a quilt before - or a t-shirt quilt. These are the "experts" that are going to create something from YOUR treasured shirts. There was a big scandal last year (2014) about hundreds of "Group-On" quilts that never got made. This is the worst. "I've got a magic marker and a sewing machine". They try to be 'creative' and start whacking the t-shirts. Again, good intentions, but horrible results. We get a lot of these 'rescue' quilt tops. The maker gets in over their head and then brings the butchered t-shirts or poorly constructed quilt top to us. We at T-Shirt Quilts of Texas are thrilled (sorta) to help you finish the quilt and turn it into a real quilt. We got a 'rescue' as in "please rescue my quilt" where the customer had found someone 'cheap' to make a quilt on Facebook. They paid $180 for this unknown maker to create her treasured t-shirt quilt. The top part of this 'finished' masterpiece measured 'almost' 3 foot across. The bottom measured over 4 feet! There was a nice couple of extra 'corners', t-shirts inserted inside-out, and other assorted problems with the project. We totally took it apart, added a bit more fabric, batting and created a quilt that the customer was totally thrilled with. Be sure to click on the picture to see it in all its glory! This is a real quilt that we received to rescue. The professional t-shirt quilt maker will have all the equipment to create your quilt, and generally does this as a full-time business. Our shop that is used exclusively for creating quilts. We have a longarm-quilting machine, professional style iron-presses, industrial sewing machines, fabric inventory and so on used exclusively to create quilts. 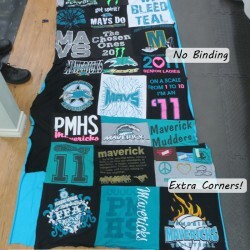 The professional t-shirt quilt maker will have made HUNDREDS if not thousands of t-shirt quilts. Ask your quilter how many t-shirt quilts they have made. 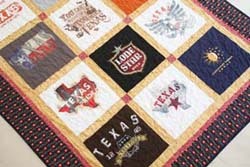 At T-Shirt Quilts of Texas we have made several thousands of t-shirt quilts over the last ten years. This is our business, and this is all we do. We are quilters and we only provide quilts that we would like to keep.